We're looking for more people to join our Yorkshire and Humber NHS Genomic Medicine Centre PPI Panel. The panel helps steer the delivery of the project. 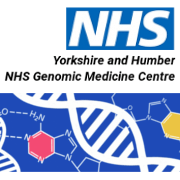 The Yorkshire and Humber NHS Genomic Medicine Centre (YHGMC) is one of 13 Genomic Medicine Centres (GMCs) established by NHS England to lead the way in delivering the 100,000 Genomes Project.